This interesting surname has two possible sources, the first is from an early medieval English occupational name for a seller of cinnamon, or a spicer, derived from the Middle English (1200 - 1500), Old French "canele", cinnamon. Job-descriptive surnames originally denoted the actual occupation of the namebearer, and later became hereditary. The second source is of Manx origin, from the Gaelic "O'Connaill", descendant of Conall, a personal name of uncertain origin, possibly composed of the elements "con" (from "cu", hound) and "gal", valour. The surname development since 1314 (see below) includes the following: John Canel (1327, recorded in the Subsidy Rolls of Cheshire), and Richard Cannell (1428, Warwickshire). The Manx version of the surname was first recorded as "Mac Connell" in 1511. 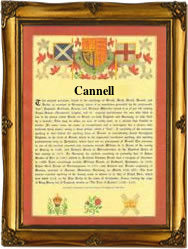 The modern surname can be found recorded as Cannell and Cannel. Recordings from the Isle of Man Church Registers include: the marriage of John Cannell and Mary Coun on February 2nd 1714, at Braddam, and the marriage of George Cannell and Isabel Lace on June 3rd 1749, at Kirk Michael. The first recorded spelling of the family name is shown to be that of Simon Canel, which was dated 1314, in the "Calendar of Letter Books for Devonshire", during the reign of King Edward 11, known as "Edward of Caernafon", 1307 - 1327. Surnames became necessary when governments introduced personal taxation. In England this was known as Poll Tax. Throughout the centuries, surnames in every country have continued to "develop" often leading to astonishing variants of the original spelling.